Create a kitchen of your dreams! Most people overthink their kitchen remodel. They will dwell on when the right time to actually to do it would be. Over-planning and over-preparing may not be the best way to determine when the optimal time to go through with a kitchen remodel actually is. In fact, it may be more beneficial to examine your kitchen and allow it to tell you when it needs a facelift. Here are just a few ways you can begin to listen to your kitchen and learn when you’ll know that it is finally time for you to have a kitchen remodel. Do you remember the days when you were eager to prepare your meals in that lovely kitchen of yours? But now, you find yourself loathing spending any time in your kitchen? When your kitchen is someplace you want to be in, then there is no need to change anything. However, if you no longer find peace and serenity in your kitchen, then a remodel might be the thing to cure your woes. Sometimes our neighbors all have kitchen remodels. We go and visit their new kitchens and have some jealousy over how beautiful kitchen after kitchen appears. This may cause us to want a kitchen to remodel of our very own. 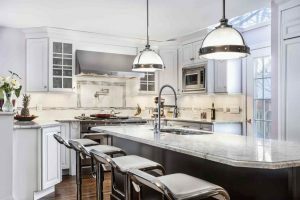 In addition, it’s not just a selfish thing to want to maintain an updated kitchen just like your neighbors, it benefits you when it comes time to sell your home. Homebuyers will be looking at comparable homes in your neighborhood and will notice if your kitchen is outdated. You will definitely reap a great reward financially if you make sure that you update your kitchen to match those of your neighbors. The one key way you can absolutely know that it is finally time to go through with a kitchen remodel is if you see it as a mess of disorganization. A clean and tidy kitchen is one that we love and respect. On the other hand, a poorly kept kitchen that is ill-maintained is one that lacks love. More often than not, when we don’t care about things we tend to not give them the attention they deserve. The same goes with the care we put into our kitchens. If they become disorganized and messy it can definitely help to have a kitchen remodel to essentially start fresh. This entry was posted on Thursday, February 16th, 2017	at 3:27 pm	. You can follow any responses to this entry through the RSS 2.0	feed. Both comments and pings are currently closed.